Hi -a new study in the US has shown vegetarians are less likely to be depressed and are happier than meat eaters. This result surprised the researchers who believed that lower levels of omega 3s from fish (EPA/DHA linked to mental and emotional health ) in vegetarian diets would mean vegetarians would be less happier and have depression, anxiety, and mood problems. Researchers believed plant-source omega-3s ALA, found in plants, nuts, oils, flax and chia are less effective in boosting brain and physical health than EPA and DHA from fish, since it’s harder for us to convert these plant sources into usable amino acids. The study group ate a healthy diet high in vegetables and fruit that included omega 3 ALA rich nuts seeds, leafy greens and oils. ALA (Alpha-Linolenic Acid) omega 3 is found mainly in dark green leafy vegetables, flax, chia and hemp seeds- hemp seeds are not generally available commercially in Australia yet though you can find them in some health food stores or online. We are still waiting for Government approval as a valid food source! walnuts, and a variety of vegetable oils. Dark green vegetables and particularly purslane-which contains more Omega-3 ALA fatty acids than any other leafy vegetable plant, freshly ground flax seeds, hemp seeds, chia seeds and raw walnuts are the healthiest sources of ALA.
Chia seed, originally from South America is really the Omega 3 star- chia has three times the amount of Omega-3 than Omega-6 and is 6 times richer in Omega 3 than fish. Everytime you add chia or ground flax to your green smoothie you are increasing the Omega 3 and its health benefits. And that is WHY regular green smoothie drinkers have reported definite changes in mood, anxiety and depression! 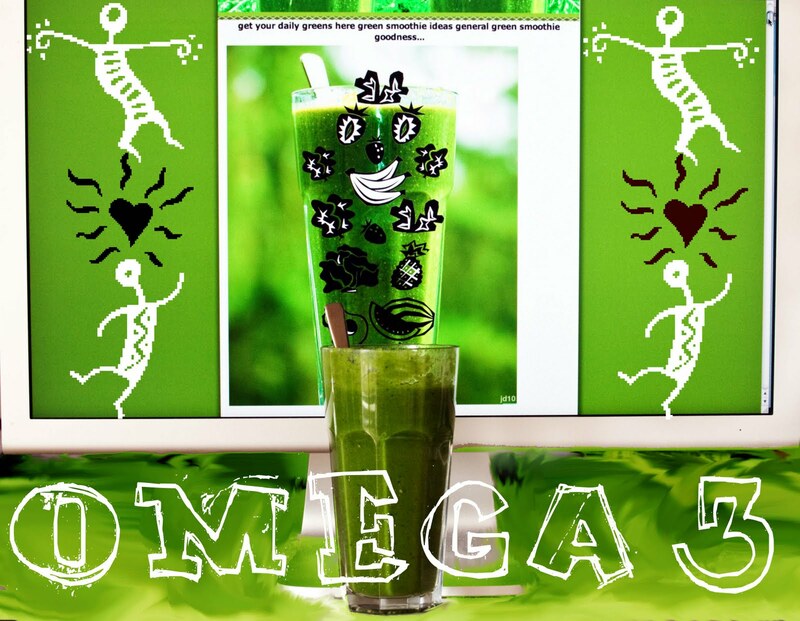 It’s all these healthy Omega 3′s in the leafy greens, chia and flaxseed. enjoy… and get happy. I hadn’t had chia until this visit to Australia. I hope I can buy them in the US. Hi Jane comments working! Chia should be available locally at healthy shops or online-I think ground chia is better in smoothies and is absorbed better than the seeds? I know you have to grind flaxseed to digest it so it maybe the same for chia though they are smaller.